Saturday, February 10th @ 7:00PM – Only $39.95 per seat! 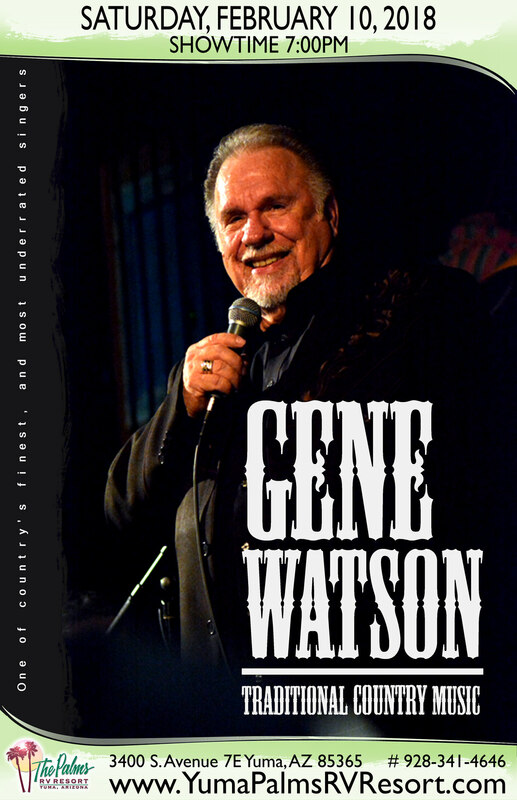 GENE WATSON This masterful country stylist from Houston, Texas has been thrilling audiences for more than 50 years. Gene’s very first radio single, the self-penned “If It’s That Easy” was released in 1962 so the entertainer is celebrating his 50 Years in the music business, a “Golden Anniversary” in 2012. Although the song didn’t make any radio charts, it did start the career of the man now known as “The Singer’s Singer.” Gene Watson’s tally of 75 charted titles, 23 top-10 hits and 6 number-one records has led to membership in the Texas Country Music Hall of Fame. Radio listeners are still transfixed whenever classics like “Farewell Party,” “Fourteen Carat Mind” or “Love in the Hot Afternoon” are played. The depth of emotion in his singing, his brilliant phrasing, his jaw-dropping range and the power in the lyrics he chooses are all factors in the awe he inspires in both fans and his musical peers. At an age when most people are contemplating retirement, Gene Watson is still making some of the greatest records of his life, receiving such accolades as Album of the Year and even Album of the Decade from journalists around the world. Watson earned the title of 2010 Country Music Legend of the Year, from Citadel Media’s Real Country Radio Network nationwide fan vote. Watson is one of the rare singers who still sings in the same key as he did 30 years ago and his audiences respond with standing ovations night after night when he nails the octave jumping last note on his most requested song, the now country classic “Farewell Party.” As Rodney Crowell so aptly stated, “Just when I think Country Music is a lost art form, something by Gene Watson catches my ear and I can breathe again.” Considered one of the finest pure-country singers of his generation Watson offers up one of the best traditional country shows in the business. His stunning voice captivates audiences and keeps his fans coming back again and again.